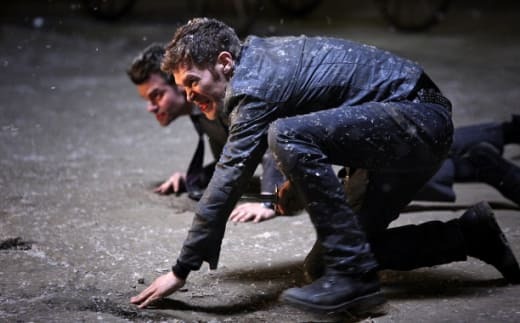 Unlike other shows which are ending for good right now, The Originals has been promised a third season, which makes tonight's finale perfect in every single way. There was drama. There was humor. There was Claire Holt. 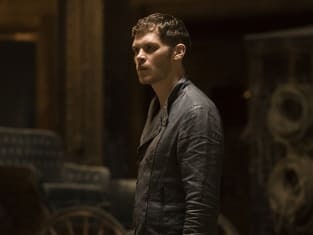 The Originals Season 2 Episode 22 ended one chapter of the Mikaelson family drama and began another one, providing closure where it was necessary but leaving myriad stories open for exploration next season. Even when they tried to make us feel sorry for her because of Esther's decision to abandon their pact, everything fell short, probably because Claudia Black was so good at playing bad. It was impossible to imagine her any other way. I definitely didn't see Esther's resurrection coming, even after figuring out that her blood was the secret to killing Dahlia. Aren't they all sort of Esther's blood? Was it Esther's form that Dahlia needed to see in order to be rendered slightly less powerful so she could be killed? How come she couldn't magic her way out of Esther's strangulation? Were the manacles effectively blocking Dahlia's magic? The rules about that are a little unclear, but what we did see was Esther finally understand that these monsters she created stick together more closely than she was able to stick to her own sister. That was the impetus which caused her to be able to sacrifice her own life for her children, abominations though they might be. She just as easily could've watched them all die, content to have finally realized her dream of ridding the world of vampires, but she didn't. Okay, yes, it's weird that she didn't. The Esther we've known since she first appeared has wanted absolutely nothing more than to kill her children. Or reunite with her children in human bodies. Except wouldn't that whole "making them all witches" thing have meant they could procreate, thus bringing Dahlia back even if Hope hadn't been born? Is this what three glasses of Cabernet does to me? Clearly I'm thinking too deeply right now. I'm just FULL of questions tonight, which is how I know this season finale was a good one. I have plenty of things to think about between now and The Originals Season 3 premiere. Such as, does Klaus trust Freya now? That's unlikely given what he saw of her power during his interlude in Dahlia's mind, but he needed a witch in the family and now he has one. Plus, he awakened to Freya about to stake him and called her sister. That's a bonus considering Davina is about to rain down the wrath of nine covens on his head. Double crossing Davina will not be a decision that won't haunt the Mikaelsons. She's quite the angry witch after her one chance to bring back Kol (in his original form) went awry thanks to Elijah's tampering with her spell. And she deserves to be. They've all effectively accepted the fact that Kol is dead, and not returning, and she's the only one trying to keep her promise. Cami was right to throw it back in Vincent's face that he essentially abandoned Davina to the role of Regent after coercing her into accepting it. He makes a great teacher and she's clearly in need of some guidance. The one thing we got tonight, which makes me incredibly happy for the upcoming season, was that tender moment between Cami and Klaus. She confessed to Vincent that she has complicated feelings for Klaus and that she believes those feelings are reciprocated. Klaus walking out of the bar after saying he would've found her no matter what was all the confirmation any of us needed. The comments section last week was pretty fairly split between whether or not Klaus and Cami should become a thing. I'm here to tell you all I'm unabashedly on that ship. I don't really consider myself a shipper, but this time I just can't help myself. Klaus and Cami, you guys. It's going to happen. I'm ready. Are you? What did you think of "Ashes to Ashes"? Are you happy Dahlia's dead? How will Davina exact her revenge on Klaus and his family? We may have a few months until the Mikaelsons return, but you can watch The Originals online right here!